A new poll from DHM Research, in advance of next Tuesday's Oregon primary, gives Hillary Clinton a 15 point lead over Bernie Sanders, 48-33. On the Republican side, Donald Trump has 45% to 14% for Ted Cruz and John Kasich, both of whom have suspended their campaign. Both parties have a more-or-less proportional method of delegate allocation in the state. The Democrats have 61 pledged delegates there, Republicans 28. A Clinton vs. Trump match-up in November was also tested. Here, Clinton bested Trump by 43-32. Although lots of undecided/other in that result, the 11 point margin is similar to Barack Obama's 12 point win over Mitt Romney in 2012. Oregon has not voted Republican in the general election since 1984. 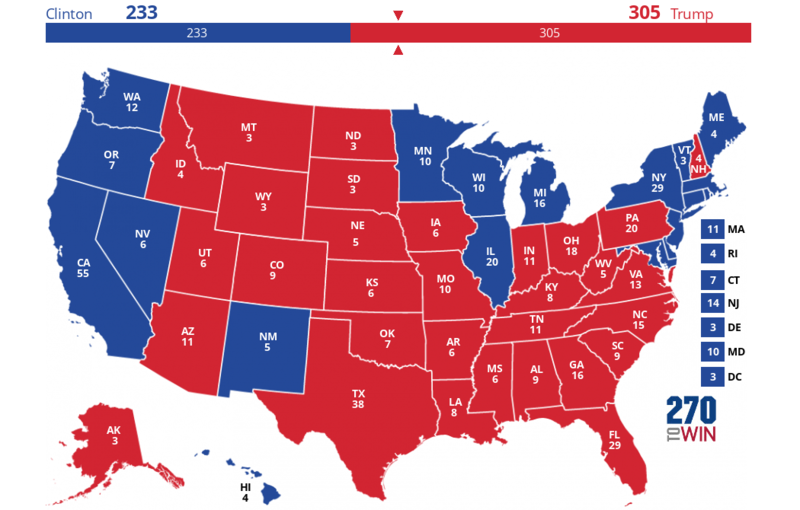 We've updated the Clinton vs. Trump electoral map based on polls for this result. A new Quinnipiac poll of Florida, Ohio and Pennsylvania finds a competitive general election battle in those states between Donald Trump and either Hillary Clinton or Bernie Sanders. This poll shows a closer race in Florida and Pennsylvania than other recent 2016 election polls; Ohio remains close. This is the first set of polls in these traditional swing states since Trump became the presumptive Republican nominee. Future polls will tell us whether this result indicates a growing acceptance of Trump as Republican standard-bearer. Note: The image above has been corrected from an earlier version. The initial version said Clinton - Sanders when it should have been Sanders - Trump. Ohio governor John Kasich will suspend his campaign today, the Wall Street Journal reports. Kasich was fourth in delegates, having only won his home state of Ohio, yet his campaign was the last one to yield to Donald Trump. Kasich's suspension comes on the heels of a similar announcement by Texas Senator Ted Cruz last night. The Republican field, once 17-deep, is now down to just Trump. Trump will meet Hillary Clinton or Bernie Sanders in November. Here's the latest (in some cases only) poll for Clinton vs. Trump in each state. This is limited to polls conducted in 2016. Alongside the result is the party winner of the last four presidential elections. Here are these polls presented in a Clinton vs. Trump electoral map (based on polling). Texas Senator Ted Cruz, reeling after a significant defeat in Indiana, has ended his campaign. Donald Trump is almost definitely going to be the 2016 Republican nominee. A new Public Policy Polling survey of West Virginia shows Donald Trump with a commanding lead in advance of next Tuesday's Republican primary there. For the Democrats, Bernie Sanders has a single digit lead over Hillary Clinton. This is the first poll of the state since February. The West Virginia Republican primary awards 34 delegates in what Politico has called "a mind-boggingly compex delegate election process". That said, given Trump's 61% showing in this poll (22% for Cruz, 14% for Kasich) and the increasing likelihood that he's on a path to the nomination, it would be reasonable to expect he'll do well in the delegate count despite the system. Sanders leads Clinton by 8 points in the Democratic West Virginia primary, 45 to 37. The state awards 29 pledged delegates which, as in other Democratic contests, will be allocated proportionately partially based on the statewide result, partially based on each congressional district. Looking ahead to November, West Virginia's 5 electoral votes seem safe for the GOP. In the most likely match-up, Trump leads Clinton by 57% to 30%. The only scenario where the poll shows the election would be close is Ted Cruz vs. Bernie Sanders. This is not a surprise, when looking at the state's history. Starting with the Great Depression-era election of Franklin Roosevelt in 1932, West Virginia was a pretty reliable 'blue state' through 1996, when it voted with Bill Clinton for a 2nd time. Since then, however, the state has voted Republican, with increasing margins in each election. Mitt Romney defeated Barack Obama by abput 27 points in 2012.